Gaze out over the city center as you swim in the Hilton Kuala Lumpur hotel's 400-foot freeform pool, with a tropical sun deck. Indulge in a spa treatment in the luxurious spa and sample award-winning modern Australian cuisine at Senses restaurant. Enjoy panoramic views from the Executive Lounge. Try new wines at the Vintage Bank or tea served with kung fu moves at Chynna restaurant. Relax in the sauna and steam rooms or work out with a free cardio-kick boxing class. If you can drag yourself away, the best Kuala Lumpur attractions are nearby. Walk to the National Bird Park, the Central Market or the Petronas Towers. 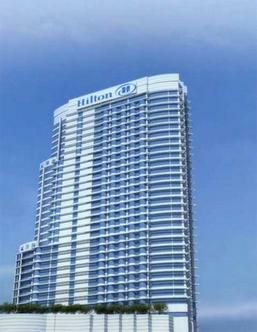 Less than 30 minutes from Kuala Lumpur Airport, the Hilton Kuala Lumpur hotel offers a business center, Executive Lounge and 14 meeting rooms for 10-1500. From Deluxe Rooms to Suites, all Hilton Kuala Lumpur hotel rooms have high-speed internet access and inset TVs in bathrooms. Executive Rooms offer Executive Lounge access.